Viewpoint Tickets - Best prices on Braves tickets, Baseball tickets and MLB All Star tickets. Location: Left field (N by NW), Georgia Avenue; third base (W by SW), Pollard Boulevard and Interstate 75/85; first base (S by SE), Bill Lucas Drive; right field (E by NE), Hank Aaron Drive (Capitol Avenue). Dimensions: Left field: 335 ft.; left-center 380 ft.; center field: 401 ft.; right-center: 390 ft.; right field: 330 ft.; backstop: 53 ft.; foul territory: average. The Braves took advantage of a unique opportunity during the events leading up to the 1996 Olympic Games. Atlanta-Fulton County Stadium, the multipurpose stadium they had played in since 1966, was becoming obsolete. 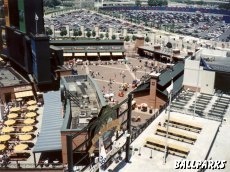 The team wanted a new retro style ballpark like the one which had then recently opened in Baltimore to rave reviews. Meanwhile, a new stadium was needed for the 1996 Olympics. So, the Atlanta Committee for the Olympic Games and the Braves agreed to combine their efforts to build another multipurpose stadium. However, this one would be different. Across the street from Atlanta-Fulton County Stadium, the new Olympic Stadium arose. It was comprised of two major sections. At one end, looking just a little peculiar for an Olympic Stadium, the structure of what would become Turner Field's grandstand was built. At the other end, an expanse of temporary bleachers completed the distorted oval. When the games were over, the bleachers came down and work began on completing the baseball stadium. Less than eight months later, the Braves had a new ballpark. The old stadium was demolished in spectacular fashion four months after that and the site was converted into parking lot. There are several ways to get into Turner Field, but most people use the entry plaza located at the northwest side of the ballpark. The columns that once supported the temporary bleachers for the Olympics serve as part of a fence that surrounds the large curved outer plaza called Monument Grove. Statues of Hank Aaron, Phil Neikro and Ty Cobb as well as the retired number statues of Warren Spahn, Eddie Mathews, Hank Aaron, Phil Niekro and Dale Murphy are there. 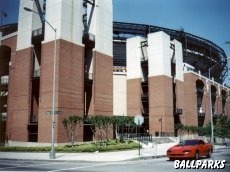 The Turner Field ticket office is located there. Ramps that take people up to the various levels of the grandstand are located at each end of the plaza. Adjacent to Monument Grove is the main entry plaza, where fans can enjoy a wide range of food and activities before they go to their seats. Foul territory is of fairly good size. Consequently, the stands aren't as close to the field as in some of the other newer ballparks. Luxury boxes are tucked away discreetly under the upper deck. There are no bleachers in Turner Field, so everyone has a seat with armrests and a back. All of the seats are dark blue with red number markers. Much of the concrete inside the park was left unpainted and the warning track is the same color. The effect is that of the Braves team colors (red, white and blue). The canopy, steelwork, some concrete surfaces and, of course, the field are green. Outside, the ballpark is brick and limestone, similar to Coors Field and Oriole Park at Camden Yards. Turner Field is not an urban ballpark. Although it is less than a mile away from downtown Atlanta, practically everyone arrives by car or bus. The site is surrounded by busy highways, which are not friendly to pedestrians. With one or two exceptions, there are no bars, restaurants, souvenir shops or other kinds of entertainment near the stadium. So, if you want to eat, drink or buy a souvenir, then you will be buying it from the Braves. However, all things considered, they do a very good job at providing what people want. The food is fantastic and there are plenty of other things to buy there. Also, the ballpark is immaculately clean. There always seems to be someone tidying up the place, whether it's sweeping the floors or cleaning the bathrooms. 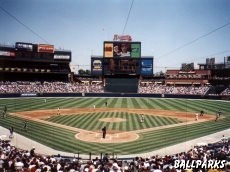 At the time of its installation in 2005, the high-definition video screen in center field was the world's largest. Fifty nine luxury suites and three party suites. Playing field is twenty feet below street level. Braves Museum and Hall of Fame is located beyond left field near aisle 134. Chop House restaurant, in the main entry plaza, overlooks center field. Scouts Alley, located under the left field stands, has interactive games for kids. Tooner Field, located in the main entry plaza, has games and souvenir shops. East and west pavilions, located just inside the main Turner Field gates, feature concession stands and games. Coca-Cola Skyfield, at the end of the upper level concourse overlooking left field, has games for children and an area where warm fans can cool off under a light mist of water. 755 Club restaurant is a private restaurant located on the Club Level above left field. Site of the 2000 All-Star game. 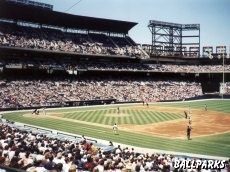 Turner Field: Rarest of Diamonds by Gary Caruso, Jimmy Carter and Chuck Perry. 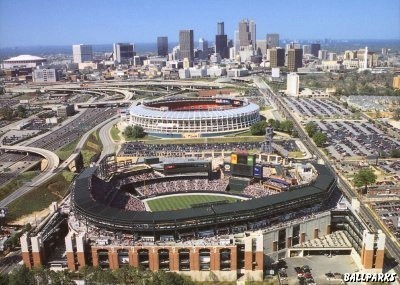 Aerial view of Turner Field © 1997 by Mike Smith. View from the north parking lot © 1999 by Paul Munsey. View from behind home plate © 1999 by Paul Munsey. View from 1st base side © 1999 by Paul Munsey. View from the corner of Pollard and Bill Lucas © 1999 by Paul Munsey. View of the main entry plaza © 1999 by Paul Munsey. Tickets to Atlanta Braves, Braves Mets, Braves Phillies, NCAA Basketball Tournament, College Football Bowl, NCAA Football, Atlanta Falcons, Paul McCartney and Wicked Atlanta provided by Ticket Triangle.